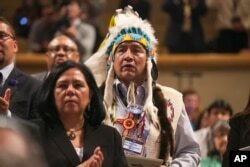 President Barack Obama speaks as, from left, Tatiana Ticknor of the Yup'ik/Tlingit/Dena'ina, Brayden White of the St. Regis Mohawk Tribe and Blossom Johnson of the Navajo Nation listen during the 2015 White House Tribal Nations Conference, Nov. 5, 2015. From tackling homelessness to empowering youth, the Obama administration is announcing a number of new steps in support of Native American tribes. In its seventh year, the White House Tribal Nations Conference brought together leaders of 566 tribes and U.S. government officials Thursday to discuss ways to remove barriers to youth success and advance tribal sovereignty, including returning hundreds of thousands of hectares of land and schools back to tribal control. “All these actions we are taking now, whether it’s on education, tackling climate change or trust reforms, are with an ear on those stories we have heard in travels across Indian country and an eye toward the health and prosperity of the next generation, including honoring tribal cultures, languages and traditions,” said Interior Secretary Sally Jewell. President Barack Obama has made improving the lives of Native Americans a top priority since taking office, by investing in job training, tribal colleges, infrastructure and improvements in the tribal justice system. Lee Juan Tyler of Idaho and other audience members wait for the arrival of President Barack Obama to speak at the 2015 White House Tribal Nations Conference, Nov. 5, 2015. Obama spoke with five Native American youths Thursday in a wide-ranging conversation about issues facing the tribes, including education, economic opportunity and the epidemic of teen suicides on reservations. One teenager told Obama that she would return from college to her home on the Navajo Nation with no running water or electricity. "It’s not acceptable that anybody doesn’t have running water in this country,” the president said. Obama was only the fourth sitting U.S. president to visit a Native American reservation when he traveled in 2014 to Standing Rock, which stretches across more than 800,000 hectares of North and South Dakota. About 40 percent of its residents live below the poverty level, and the unemployment rate is near 80 percent. Obama called the stories he heard during his visit "heartbreaking." The president traveled to Alaska in September, announcing new investments to help tribal communities vulnerable to the effects of climate change. Obama also announced the renaming of the tallest mountain in the United States, Mount McKinley, to its Koyukon Athabaskan name, Denali. In July, Obama traveled to the Choctaw Nation in Oklahoma, launching an initiative to make high-speed Internet more accessible to tribal members. This year’s White House summit continues its focus on Native American youth with the Generation Indigenous initiative launched last year, including providing grants to support strategies that address barriers to college enrollment and career readiness. The administration also is focusing on other areas, including social services, criminal justice, housing and mental health. “We have got far higher rates of suicide, particularly among tribal youth, than any other group identified across the nation. And so we are digging into the reasons why. And we are cooperating among our agencies to see if we can be more effective,” Jewell said.